Sometimes the most normal, everyday occurrences lead to some of the most incredible moments of your life. These moments are never planned, they just happen. I live for these moments. They are as raw and real as life can be. The situation may seem small or mundane, and one could easily ignore it and let the moment pass. These are the moments that come on like a freight train and before you know it, you’re standing right in the middle of the tracks. You could either step away, or stand directly in the path and get hit with the weight of the impact. I react with my heart. It was a hot day in Charlotte, North Carolina. The combination of the extreme heat and the act of taking three boys grocery shopping led to high levels of impatience and irritability for everyone involved. I only wanted to get in and out of the grocery store without a ton of requests from my boys for things I could not afford. Being a working single mother of three, is hard. It tests your limits on every level: emotionally, physically and financially. This day would be no different… except for the heat. Somehow we managed to drive to the grocery store without a major fight breaking out among the siblings. One small victory for me. I had to tackle my shopping list without buying anything extra the boys would beg me for, or randomly throw into the cart when I wasn’t looking. Surprisingly, my “No, we can’t get that today” statements, were heard and accepted without much backlash. I remember thinking my children were being amazingly compliant. In retrospect, I think my children finally came to understand, although their mother worked hard, she had very little means. Finally, we approached the checkout… perfect, we were next in line. In front of us stood a woman and her daughter who were placing all of their purchases on the conveyor belt. I began to pull my own groceries out of the cart thinking, “I wish I could afford more for my boys…” yet, I was grateful for what we were able to purchase that day. I jumped when the woman in front of me shoved my groceries back and slammed the plastic divider between our purchases. I was so shocked by her outburst I didn’t respond. The cashier began to cry. I glanced at my sons, all three of them staring wide-eyed, with their mouths open. The young cashier began sobbing and ran out from behind the register. It was the last we saw of her. A line was now forming behind me and I could hear people making comments and becoming impatient. A replacement cashier entered behind the counter and continued the transaction as the security guard approached. “What are you looking at?” The woman yelled at the security guard. I heard Rocky mumble, “This is about to get good.” I nudged him with my elbow to keep him quiet. “Ma’am, I’m just here to see that everything goes smoothly,” the security guard replied. I must admit, I rolled my eyes. For once I had made it in and, well, almost out of the grocery store in less than thirty minutes, with three kids in tow. The new cashier hurriedly rung up the items and hit total. 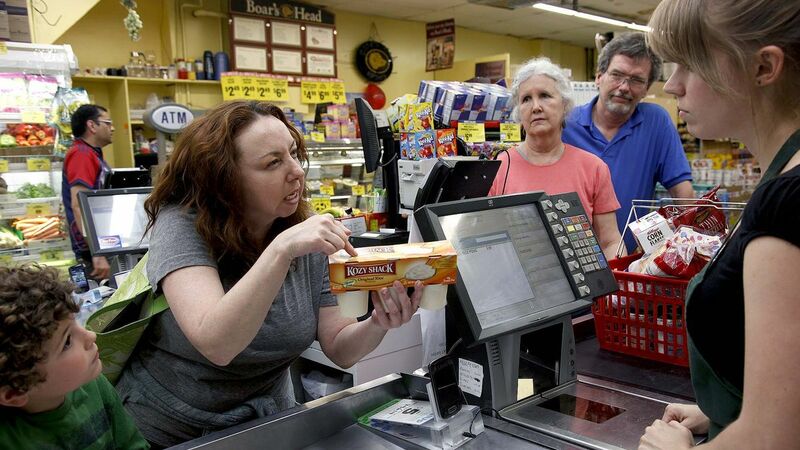 The woman extended her arm and handed the cashier her EBT card. Before the woman could respond, I said, “I got it!” I handed the cashier a $20.00 bill. Slowly the woman turned around and looked at me. Her entire demeanor had changed. “Thank you,” she said, staring me straight in the eye. “You’re welcome,” I replied. I collected my change and slid it straight into a donation bucket on the counter. The woman and I exchanged smiles. They gathered their bags and slowly made their way to the door while everyone stood in silence. “Mom, why did you pay for that lady’s stuff?” Rocky asked. I was aware that everyone was staring at me, including the security guard. But that wasn’t all there was to the story. In the car, on the way home, Marc and Rocky announced they both needed laptops for school. “Laptops? Are you kidding me?” I asked. I had no idea how I was going to pull this off. If you keep yourself open to it, incredible things happen every day. Okay, published! Starting part 3 next. Read 2 and waiting on 3. You do realize that your series are addictive, right? I love you, too. I love you enough to encourage you to make dinner because it’s the best thing for you and your family. I’ll just be sitting here wondering what’s coming next. Sitting here on the edge of my seat, knowing it’s going to be good! LOL! Let’s hope so! Hmmmm, whose appetite to satisfy first… yours or my boys? Yea-I love reading your mini series! Thank you for sharing such a moving post. I am so glad you took the “high road”. I fear I may not have chosen so wisely. That was the best example for your boys. You are so right, we never know what is happening in another person’s life and what they are carrying. I am sure you made a huge difference for this woman and her daughter.